Irene and Kai are locked in a race against time (and dragons) to procure a rare book. They'll face gangsters, blackmail, and the Library's own Internal Affairs department. And if it doesn't end well, it could have dire consequences on Irene's job. And, incidentally, on her life. This series is a fun mix of action, intrigue, history, fantasy, and a hint of romance. It is best read in order. Not only will you be less confused but you can better appreciate certain developments. The story starts with what should have been a simple book trade but events quickly escalate. We move quickly from an adventure but to dragon politics and mysteries. It seems that a Librarian may be involved which violates the Library's pledge of neutrality. That pledge not only keeps the Librarians safe, more or less, from the affairs of the Fae and the Dragons but also keeps the balance throughout the worlds. Irene and Kai need to find the suspected rogue librarian and try to restore balance. However, they are on their own. If they are caught, by anyone, the Library will disavow them and them leave to survive on their own. The set-up for this series allows for a wide variety of worlds and Cogman has had fun exploring them. Most of this story takes place on a world that has a country reminiscent of the USA in the 1920s and there's a wonderful scene where Irene finds herself in front of a crowd extemporizing on the evils of alcohol. The longer she's on stage talking, the longer she can avoid getting captured by one of the groups trying to coerce her. It was a fantastic scene showcasing Irene's quick-thinking and wit. Irene is clever, energetic, and practical, a good foil for Kai's impetuousness and impatient youthfulness. Kai and Irene are apart some of the time and Kai had to take the lead, which he did reasonably well though I found his parts of the story to be less interesting than Irene's. She can carry the story, he can't. 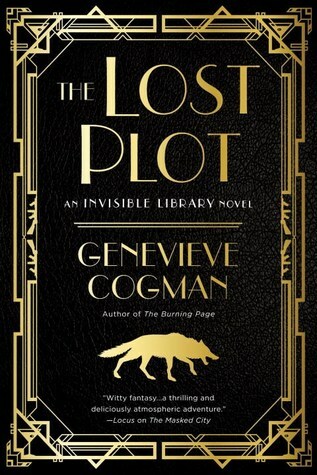 "The Lost Plot" was full of interesting characters, intrigue, humor, shenanigans, and action. There are consequences to Irene and Kai's adventures and I can't wait to how they handle them and what Cogman throws at them next. These sound so good but I'm just not that into the 20's. Only this book is set in a 20s type world. Each book takes place on a different world and not always in an American setting. Give the first book a try and see what you think.